The Xiaomi Redmi 2 comes in a simple box made of recycled paper. The package contents are just as basic: you get a compact 1A charger and a microUSB cable. That's it. If you order the Xiaomi Redmi 2 at XiaomiShop.com, you'll also get a flip leather case, a screen protector and a touch pen free of charge. The Xiaomi Redmi 2 has the same 4.7" HD display as its predecessor and a more powerful battery, which however didn't result in increased size and weight. The Redmi 2 is actually a tad more compact and lighter than the Redmi 1S. At 134 x 67.2 x 9.4mm, it weighs 133g, which is a good 25g lighter. 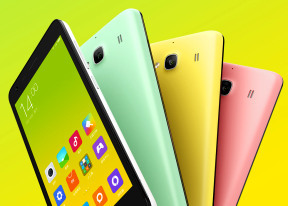 The reduced weight aside, the Xiaomi Redmi 2 looks a lot like its Redmi 1S predecessor. The curved corners of the new model make it look even more compact. The red backlighting of the capacitive keys is a trademark accent of the Redmi lineup and it works pretty well here. The black front is actually a piece of Corning Gorilla Glass, while the removable battery cover is manufactured from high-quality matte plastic. The removable cover fits tightly but can be easily popped open, no squeaks when handling the phone. Holding and using the Xiaomi Redmi 2 is quite pleasant. The matte rear cover provides excellent grip, while the reduced body weight and curved sides help both the feel in hand and pocketability. The Xiaomi Redmi 2 boasts no special materials and premium finish, but is solidly built and looking quite durable. The new Xiaomi Redmi 2 looks quite like its predecessor and the layout if controls is identical. It uses capacitive buttons beneath the display, with the familiar red backlight. Although the left key has the old Contextual Menu icon, it actually opens the task switcher. Upon a long press, it will show the advanced menu, if available. You can configure long press for all three keys, but the options available are just three: Contextual Menu, Task Switcher and Close App. The secondary 2MP camera is next to the earpiece, along with the proximity and ambient-light sensors. The left side of the phone is completely bare. On the right, we find the silver-painted volume rocker and the power/lock key. The 3.5mm headphone jack is on top of the Xiaomi Redmi 2, while the microUSB port and the primary microphone are over at the bottom. The 8MP camera lens is placed between the LED flash and the loudspeaker grille. The secondary microphone is also around. The rear cover of the Redmi 2 is user-removable and lets you reach the 2,200mAh battery. Unfortunately, the two micro-SIM cards and the microSD card are confined by the battery, and therefore not hot-swappable.